By 1984 The British Art Show had rolled around for its second outing – this time starting in England’s second city before visiting Edinburgh, Sheffield & Southampton. A three strong selection panel (comprised of Jon Thompson, Marjorie Allthorpe-Guyton and Alexander Moffat) chose eighty artists of whom a dozen or so (definitions again) might be termed abstract painters. What is more striking by comparison with 1979 is the effusion of figuration, over twenty of whom were included. Although none of the selectors referenced it directly, they all, in one way or another, gave a nod to The New Spirit show in their texts. Some were fairly ‘classical’ (Kitaj, Auerbach, Kossoff), others Expressionistic (Bellany, Rego, Kiff), and there were the Scots, oddly enough Bruce McLean heading them up having returned to painting, along with newbies Stephen Campbell and Adrian Wiszniewski. And frankly much else besides from conceptualists Terry Atkinson and Art & Language to the really odd stuff that the ‘new figuration’ could turn up…John Hyatt, John Yeadon, Graham Durward and Peter Bailey. Those abstract painters who were included were very much the established ‘team’. John Hoyland naturally enough, Gillian Ayres, Hodgkin, and from that East End, lesser feted group, Basil Beattie. Sitting somewhat aside from them were the cool minimalists, Alan Charlton, Peter Joseph and John Carter and those on the fringes of abstraction by this time…John Walker, Ian McKeever and, reflecting the still small chinks of light in female representation (13 in all), Therese Oulton. In terms of encouraging and spreading the understanding of abstraction the emergence of cheaper colour printing began in earnest in the later seventies and impacted on the production of catalogues, pamphlets and postcards. When the Jacobs Gallery began producing small catalogues each of her exhibitors benefitted from the inclusion of several colour images too. The catalogue of this second British Art Show reflected this with a goodly number of colour images spread through the publication rather than, as before, a single section. It was a good job colour printing was getting cheaper as budgets (especially in the public sector galleries) were severely constrained in the first half of the decade as recession raged. Indeed the whole political scene was torrid over much of the decade, beginning with the Falklands War, continuing with the Miners Strike, the Greenham Common protests and ending with the rumblings of the Poll Tax revolts that ushered in the 1990’s. 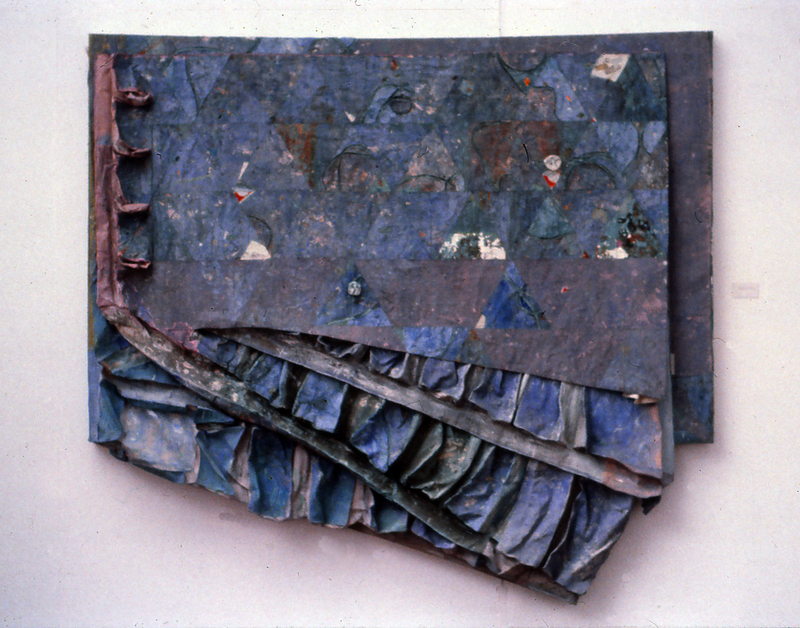 One of the major events of the mid decade were the simultaneous shows by John Walker ,of paintings at the Hayward and prints at the Tate, in 1984. Walker had announced himself as one of our pre-eminent painters back in the late sixties at the Hayward with huge canvases that combined oddly shaped trapezoids bunched in groups set against rugged colour fields. Following prolonged sojourns in Australia and the States…he returned with paintings that, whilst still abstracted, were also struggling to accommodate the figurative impulses that the ‘new spirit’ had released. In particular he revelled in a long held obsession with the old Spanish Masters, Velasquez and Goya, as well as drawing upon imagery drawn from the Pacific cultures. These paintings were increasingly mixed together with religious text extracts, still very big, rugged and muscular, exploiting tonality and modelling in a way quite alien to many of the other leading figures in abstraction and set a challenge that has rarely (if ever) been matched in subsequent decades for painting that is both utterly authentic and painfully honest on the grand scale. One of those painters who had learnt a lot from the example of Walker was Hugh O’Donnell. 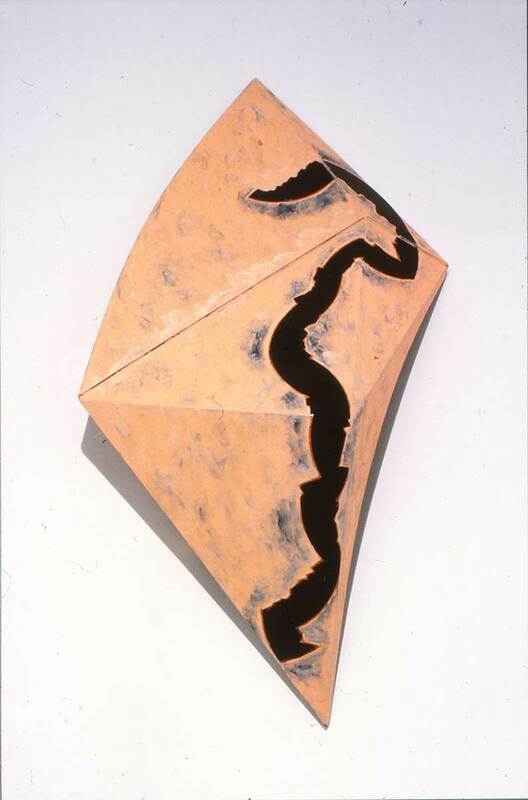 O’Donnell was the only artist to escape relatively unscathed from the critics mauling of the 1980 Guggenheim show. Subsequently his star was on the rise and he was taken up by Marlborough with whom he had shows in New York and, in the spring of 1985, London. The work in this show was fresh and vital, often as Ronald Rees put it in the catalogue “a new tactile quality and painterliness [with] a strong sense of immediacy”. The strong graphic, design elements went far beyond where most of the younger generation discussed so far had dared at the time and that painters like Hopkins and Mali Morris would venture late into the subsequent decade. The difficulty of definitions actually increased over the decade as the continuing fall out from The New Spirit exerted its influence. Robert Ayers and Tony Godfrey put together a show at The Serpentine that ran through mid-winter in 1984/5 titled Landscape Memory & Desire of what had been, essentially ’abstract’ painters a few years earlier but now fell under a rubric of new-romanticism, Michael Porter, Andrew Mansfield, Maria Chevska, Peter Lewis, Theresa Oulton and Adrian Searle. All were, in one degree or another, making ‘abstract’ paintings albeit several of them flirting with and even overtly embracing clear elements of figuration. In truth it was less the examples of figuration in New Spirit (few of whom were interested in landscape) than than the licence that it gave to artists whose inclinations were more towards a far more rooted desire for English romanticism. The subsequent career trajectories of both Porter and Oulton saw them push further in the direction they had set here though for them and Mansfield the tide of fashion has seen them rather marginalised despite their evident quality as painters. The fluid, seemingly one touch, exploration of form and colour exemplified by artists such as John McLean and Mali Morris in quite a few shows over the decade is another means of abstract picture making that has been somewhat marginalised, other than in recent works by Peter Joseph. It takes a certain kind of ‘commercial’ dealer to make a really long term commitment to an artist to allow them the freedom to make work that sits outside what is pretty much ‘allowable’ by the official organs of taste. In Joseph’s case the Logsdail’s at their Lisson Gallery, a nice irony really when the ‘market’ is seen (mostly) by painters as a bad thing. Opportunities to get back to Birmingham were few, despite it being less than an hours drive away. 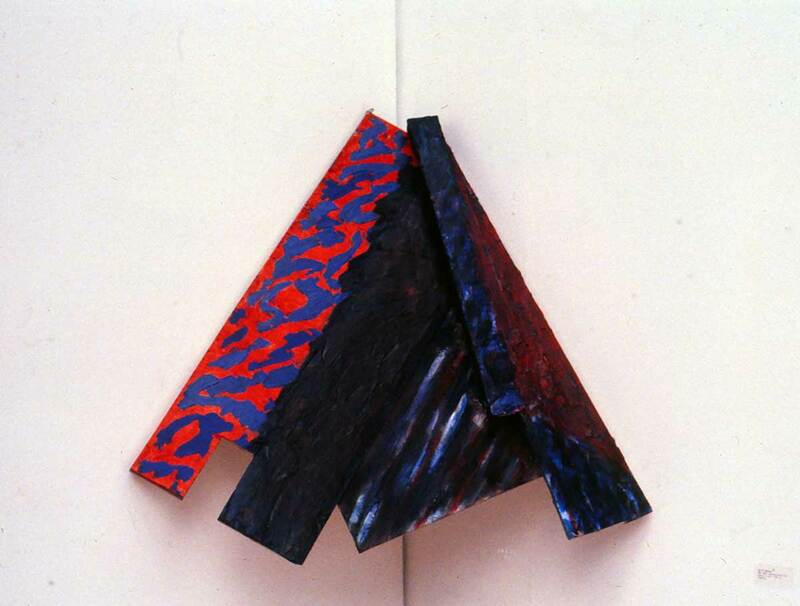 But in the latter part of 1985 Clyde Hopkins show and in the spring of 1986, Terry Shave and then Barrie Cook presented excellent opportunities at Ikon for studying abstraction. Three very distinctive and quite different approaches to the genre each had qualities to admire. Hopkins was already beginning to strengthen the structures of his canvases, although the gestural marks and colour clouds were still much in evidence. Shave presented large almost monumental canvases where the neo-romantic spirit was informed with a deft, dynamic touch and suffused with a marvellous light. Sadly much of his work of the time was destroyed later but the canvas Inferno Storms, over three metres high gives an indication of the vigorous and confident qualities in the painting. praise famous men (and women)…back in the 1970’s when I worked at the major regional gallery our Director, the amazingly independent creative thinker Hugh Stoddart, hatched an ambitious plan. We would show, over a year or so, three seminal figures in the USA’s then nascent Conceptual/Performance Art scene – Dennis Oppenheim, Chris Burden & Vito Acconci. Hugh sadly departed the Gallery (to concentrate on his own creative career as a screenwriter) before we could carry out the full plan. We did manage to invite Chris Burden to make a piece – Diamonds Are Forever – and he arrived in Birmingham replete with a diamond (alledgedly purchased en route at Covent Garden) that formed the centrepiece of an installation that comprised the diamond twinkling in the velvet blackness of the entire basement gallery (quite a large space) [see here p.21 for an illuminating if partial account of the event. And sometime later, just after I departed Ikon for the East Midlands, Denis Oppenheim arrived to install his Vibrating Forest. But sadly the trail then went cold…for what reason I don’t know…and Vito never made it to the gallery. He recently died and this touching tribute to him seemed to me to sum up what we missed all those years ago. With Dennis & Chris having shuffled off stage a while back a generation of amazingly inventive and revolutionary artists is slipping away. A friend tweeted a picture recently of her admiring ‘Soaring Flight’ by the incomparable Peter Lanyon. 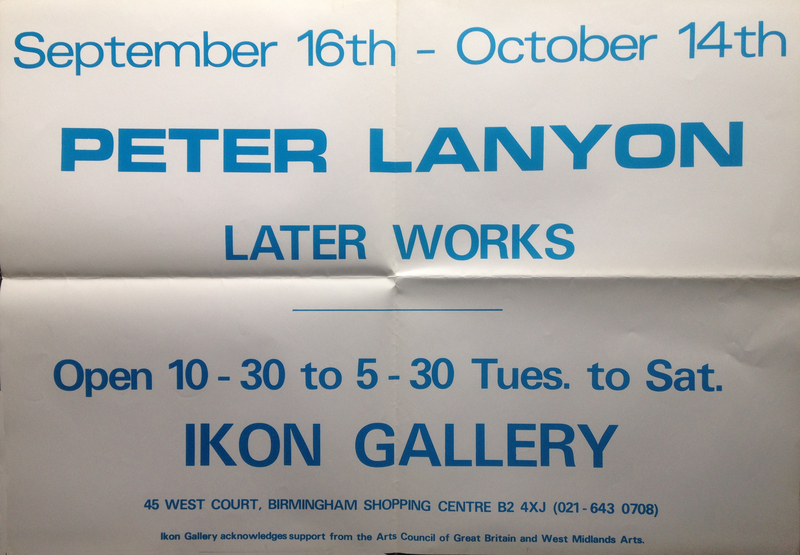 It got me to thinking back to a show I was closely involved in some 37 years back when I worked at Birmingham’s Ikon Gallery. It was titled ‘Peter Lanyon: Later Works and here’s how it came about… I’d been working at the gallery for just over a year when Hugh Stoddart was appointed Director and in our early conversations either he or I raised our joint interest and enthusiasm for Lanyon. Hugh had been working in the South West as Visual Arts Officer for the region and had, in some way, been fortunate to have met Sheila Lanyon (the artist’s wife) and have the opportunity to view a portfolio or two of drawings, particularly late drawings made on his last trip to the USA. Between us (at his suggestion) the idea of a show emerged. It was a hallmark of Hugh’s unbounded energy and ambition for the gallery that a museum style show (for which we had virtually no resources or funding) might even be contemplated. It was furthermore a measure of his unbounded generosity that he encouraged me (a complete rookie) to take a substantial role in creating such a show – I owe him a lot. Looking back at the Lanyon materials I have, it might seem I’m making all this up as curiously the show has been omitted from the history…the listings of Ikon exhibitions in both of its survey shows of its history make no reference to it and I know of no recent listings of exhibitions that carry a record of it. And yet it did happen! I have a poster for it here. As mentioned the gallery operated on a shoestring and often ran a deficit (we several times had to get bail outs from the Arts Council over the four years I was there) hence the plain cheap poster and sadly no publication of any kind. As we were planning it the Whitworth in Manchester was in the latter stages of planning a large show that toured to several venues ending its run a few days before our show opened (I’m fairly sure nobody pointed this out to us and I cannot at this distance quite work out the chronology…as we certainly showed quite a lot of the works also on the tour..?). Nonetheless we were able to put together a good deal of material. Somehow Hugh persuaded Birmingham Museum to let us borrow Offshore and we had a long time supporter of Ikon in the person of Paul Aston (of top quality framers Gales) who lent us his Lanyon, a real beauty – Loe Bar. Lanyon’s dealers Gimpel’s released a fair few works including Silent Coast and key late paintings including Clevedon Bandstand, Clevedon Night and Clevedon Lake. But the real deal was the agreement to let us have access to the drawings. I was deputed to go down to St. Ives over the summer and select from the portfolios a number of previously unseen drawings. My recollections this many years later are briefer by far than I might wish. I do remember being particularly struck by a frottaged work of a Texan car numberplate and thinking it rather ‘pop’ and of others of manmade objects. All distinctly ‘unlanyonish’ as I’d previously known them. Whether these works have been widely seen elsewhere over the past four decades I don’t know…whether they were ever intended to be ‘published’ is perhaps a question too. After all its not at all clear that Lanyon ever intended his constructions to be exhibited but they are a regular feature of more recent surveys of his work. I do recall Sheila Lanyon being a generous host to the rather gauche young man who came to stay. She made me a hearty meal in the kitchen at Little Wheal Owles on Carbis Bay (a place that really ought to have been acquired for the nation given its seminal place in the St. Ives story) where I sat admiring the largest Alfred Wallis painting I’d ever seen (up to and including this very day!) on a table sized piece of timber and then showed me to my overnight room. At the head of the bed was a large Lanyon canvas…again I’m struggling to bring it properly into view but it was whites and very pale greens and as daring compositionally as Silent Coast or more so. Whether it was a completed work or not I do not know, it certainly looked so to me, but I’m pretty certain its not appeared in any of the Lanyon shows I’ve seen. At the time I knew I was extremely privileged to have had the opportunity to examine Lanyon’s work at such close quarters and over the years it has repaid me as a painter many many times over. has been keeping me from here for very nearly a week… I had hoped to post a considered reflection on the current Ikon Gallery exhibition As Exciting As We Can Make It, Ikon in the 80’s that in a very modest way I made a contribution to but it seems now that the moment has gone. 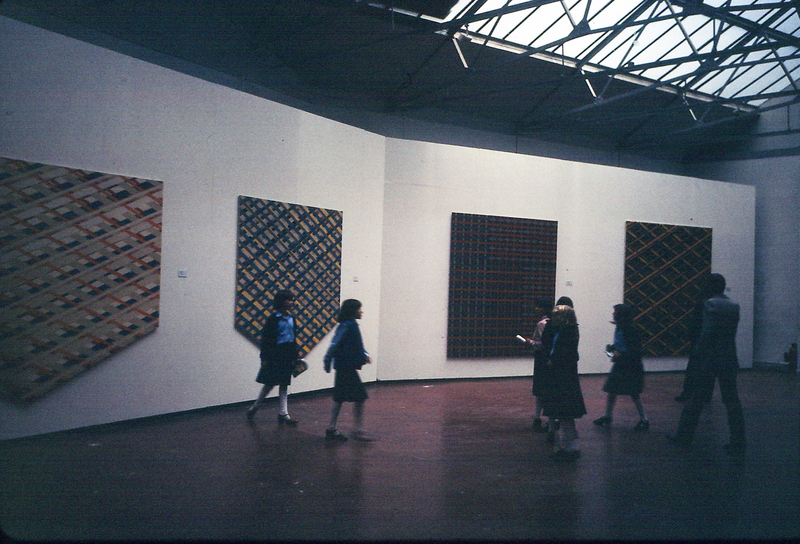 However as a tiny contribution to the celebration the picture above is the only image I have of the major Sean Scully show we mounted in 1980/1 – just a pity that it is so murky. The catalogue for the show has quite a number of my pictures taken at the time and full credit to their team for cleaning them up to make them acceptable for publication! The current show was quite a nostalgic occasion, meeting old friends and colleagues and being re-acquainted with work I hadn’t seen since back then. Some pieces stood up remarkably well – a sculpture by Shelagh Cluett and a beautiful drawing by Ron Haselden flanked by a huge Terry Shave canvas; a lovely Bert Irvin (who turned up at the event still a sprightly 92! ): the imposing Dennis Oppenheim piece that dominated the large rear gallery on the top floor. Overall it’s well worth a visit – and I say so not simply because I was a very small cog in the machine from 1977 to 1981. Stephen MacInnis reports on his children’s use of glue…and how quite a bit of it ends up on the floor. It reminded me of (and gave me an excuse for) further visual reminisces of my earlier life as Gallery Assistant at Birmingham’s Ikon Gallery back in the 70’s. This is one of Mick Moon’s huge loose canvas pieces constructed from imprints made in the studio on the floors and other surfaces using PVA glue to transfer the form onto the canvas. Moon (the brother of the late great Jeremy...who tragically died far too young) was really onto something with these pieces though I don’t think he pursued the idea for very long or took them to where they might have gone had he done so. In any event I loved them (and so did the John Moores Painting Competition judges for one of them won first prize at the 1980 exhibition) and wish he’d experimented further with the idea. Let’s see if Stephen’s children pick up the trail! My last entry referred to my friend Robert Luzar, Robert hails from Toronto by way of Slovenia (where he was born and lived until the age of seven) but has been resident in the UK studying for the past twelve years (he has just completed his PhD at Central St. Martins). Whilst Robert and his wife Natalie were staying with us I had a ping back on my Jack Bush post from Dr. Sarah Stanners who is currently working on a Bush Catalogue Raisonne to coincide with a major show in Canada. This coincidence got me thinking about other Canadian connections one of which was the appearance of the painter David Craven in a show at the Ikon back in 1980 of five artists from that country. 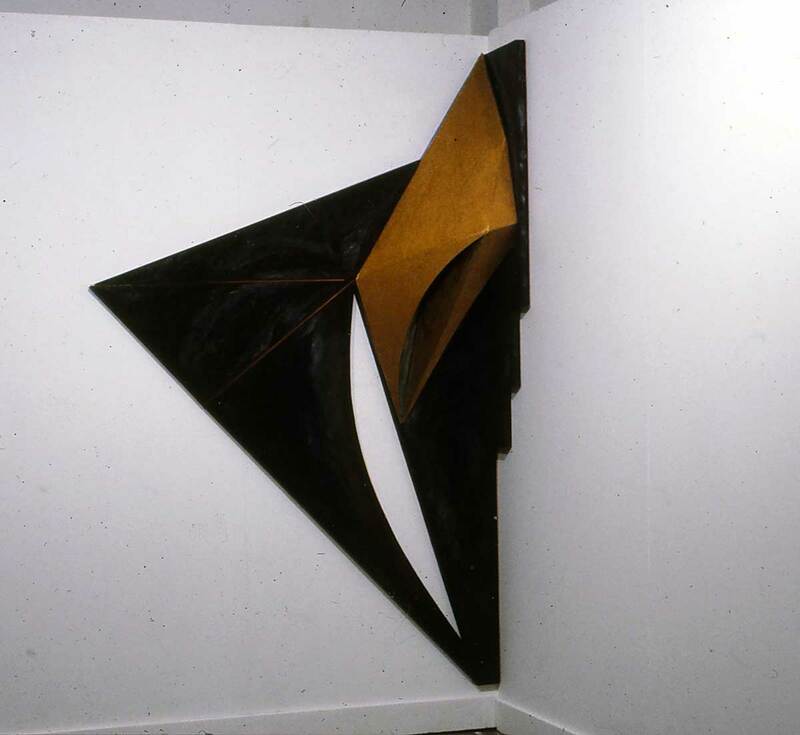 At the time his paintings seemed quite cutting edge…literally so as he combined shaped canvases with ingenious construction into corners of spaces (see above and below). I was much taken with these although also a little irritated! 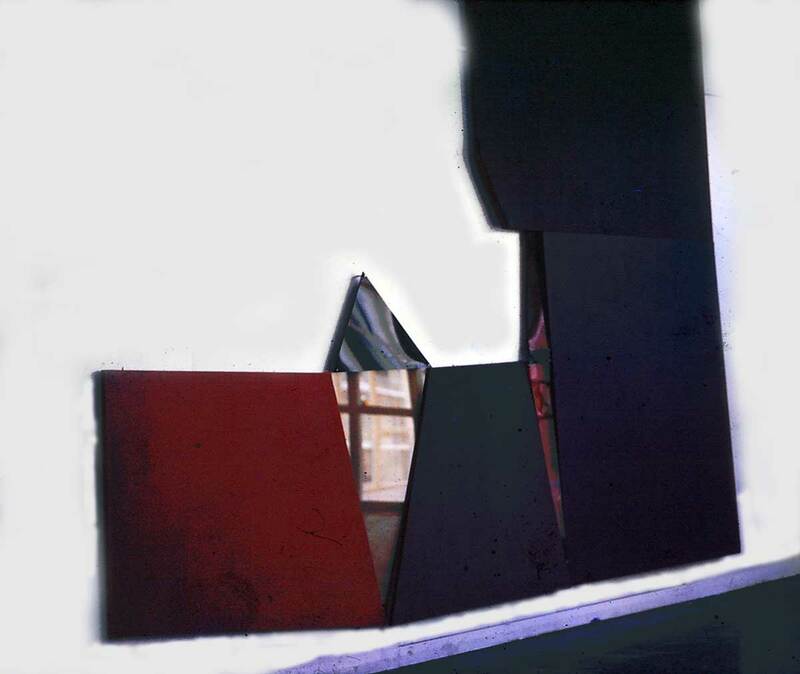 As about six or nine months earlier I’d abandoned my huge paper with reinforced glass fibre support pieces to start making plywood constructed corner pieces (see below) and had yet to exhibit any of them. I naturally became convinced that everyone I knew locally would think I’d ripped off the idea from Craven. Here’s one from my archive…this is a composite piece from 1972. It was approximately 11 ft high and around sixteen long. The central section was comprised of perspex panels mounted onto the wall slightly away from it to lie flush with the canvases. They were monochromes, made with designers gouache (in industrial quantities!) suspended in acrylic copolymer emulsion – I know the colours were very fugitive but the piece was destroyed donkey’s years ago anyway… The forms were derived from a part of a floor plan of one of the major buildings in Florence. I was describing this piece to my friend Robert Luzar who is participating in the current HMS exhibition ‘The Mark’ and spent a pleasant couple days with us to be at the opening of the show. It was in the context of what we see now of the past…what seems to be the currency of the past is the ‘avant garde’ of that moment rather than the majority of works that actually dominated the period. So although conceptual art might be thought of as the dominant mode in 72 it was actually still relatively little exposed or visible in the places one could see work and discuss it. That of course led onto thoughts about how the advent of instant information has transformed the way in which we source, discuss and, perhaps, dispose of cultural ‘product’ nowadays? Reflecting on the discussion made me thing of several things…firstly how privileged my generation of students were. I reckon each of the canvases required somewhere between six and a dozen tubes of gouache…along with a goodly dollop of the emulsion…n0t to mention the canvas and the perspex. Goodness knows how much it would have cost to make had I had to fork out for it. But of course it was all free to me…as was the educational opportunity itself. 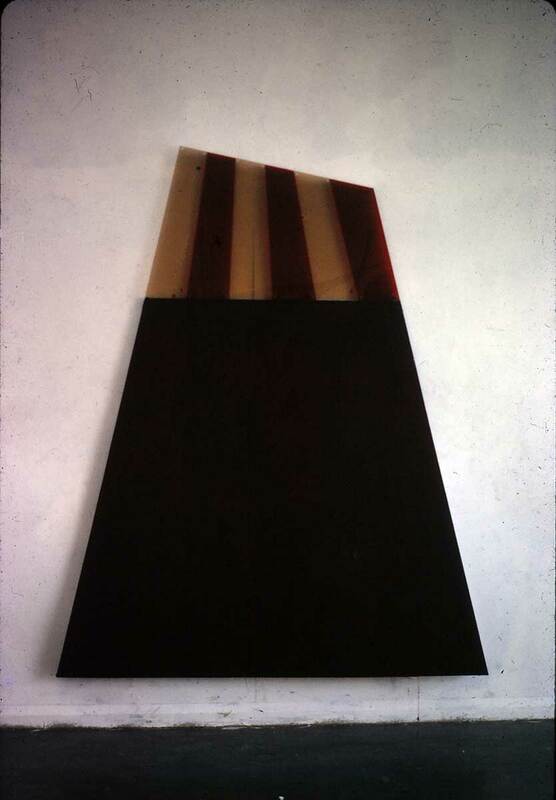 I’d sweated blood over the dark claret perspex strips that sat behind the smoked perspex and which all sat atop the canvas underneath (the piece was around five feet high), debating how and what intervals would be ‘right’ for it. It was sitting in my space in the studio the day that the painter Ian Stephenson arrived to do crits. He came into my space, took one look at it, and said “the canvas is fine but get rid of that f******g perspex!” It was acerbic criticism at its finest! Stephenson sadly no longer with us was a fine painter – check out his work, which I suspect rarely sees the light of day in our major museums. Finally I have been wondering what and whether is the protocols around the remaking of work from the past? I’m pretty sure for example that some quite well known figures have gone in for a bit of what might euphemistically be called “revisionism” over the years. But equally it seems to me a faithful reconstruction of a work of one’s own ought to be nobody’s business other than the artist her/himself? This came up just the other day at Birmingham’s Ikon Gallery where the French painter Francois Morellet was showing pieces that did just that…albeit scaled up (4:1) to be even bigger than he had originally made them.